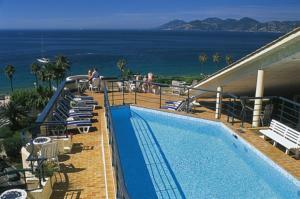 Check out more fabulous Cannes hotels! Attach to a chair and protect your valuables at the beach! Buy from Amazon. Light, easy dry beach/picnic blanket. Buy from Amazon. Hands-free 8MP pics and videos up to 5m deep. Buy from Amazon. Hand-painted insulated water bottle. Proceeds go to charity. Buy from Amazon. Zip up wet, sandy beachwear; leave your clothes dry. Buy from Amazon. 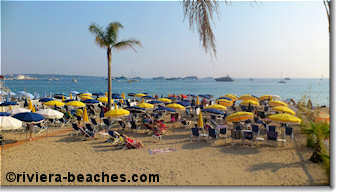 For those tired of bruising their feet on the galets of Nice beaches there's good news: all Cannes beaches are sandy! Well, not all. 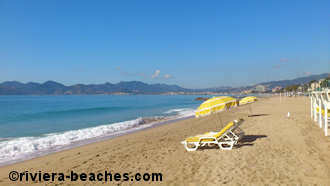 Technically the beaches of the Iles de Lerins count as part of the Cannes coastline and those beaches are rocky. The fine, white sand that makes Cannes beaches such a delight is replenished before the season begins in mid-May (in time for the Cannes Film Festival). Often Cannes winters involve substantial erosion of the beach as fierce storms can whip up the otherwise calm bay. 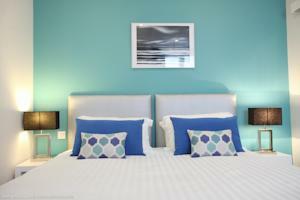 See more about Cannes. The Cannes coastline runs 15km from the foothills of the Esterel mountains to the eastern city limits and including the Iles de Lerins. 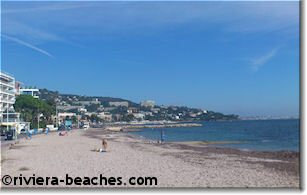 About 7.5km of the Cannes coastline is beach. There are 13 public beaches, two muncipal beaches and 33 private beach restaurants. The coastline of Cannes proper can be divided into five separate beach zones: Gazagnaire, the furthest east; Port Canto near the port of the same name; La Croisette where most of the hotels lie; Boulevard de Midi west of the town center; La Bocca in a residential neighborhood furthest west. 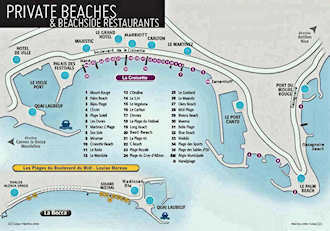 Each zone is a mixture of public and private beaches although La Croisette has the smallest space devoted to public beaches and the most expensive beach-restaurants. 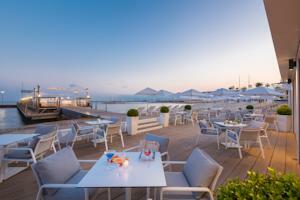 La Croisette is chock-a-block with expensive private beach restaurants. The little beach space open to the public is quite crowded in the summer with the exception of the managed municipal beach, Plage Macé. 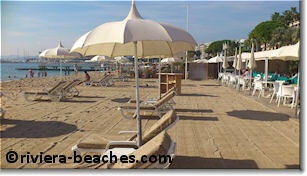 During the Cannes Film Festival these beaches are reserved every night for parties. More. Port Canto has a port, of course, and several public and private beaches to the east and west. The private beaches are slightly less expensive than those along La Croisette and there's a great public beach: Plage Zamenhoff. More. Boulevard de Midi beaches are more relaxed and less expensive than those along La Croisette and attract a loyal local crowd. The private beaches are clustered at the eastern end and then there's a long stretch of public beach until two private beaches at La Bocca. More. Gazagnaire beaches are named after the boulevard Eugene Gazagnaire that runs along the Pointe Croisette. There are no private beaches here, only a long, narrow stretch of sand that compose the two public beaches of Gazagnaire and Mouré Rouge.